Sail glorious Halong Bay, fly South to discover the history of Vietnam before disappearing back in time to World Heritage-listed Hoi An, all in 5-star luxury. Spend two glorious days cruising to Cat Ba Island through extraordinary Halong Bay. Fly south to discover the royal history of Vietnam in Hue before disappearing back in time in World Heritage-listed Hoi An. In Siem Reap, attend an extraordinary gala temple dinner at an Angkor temple. 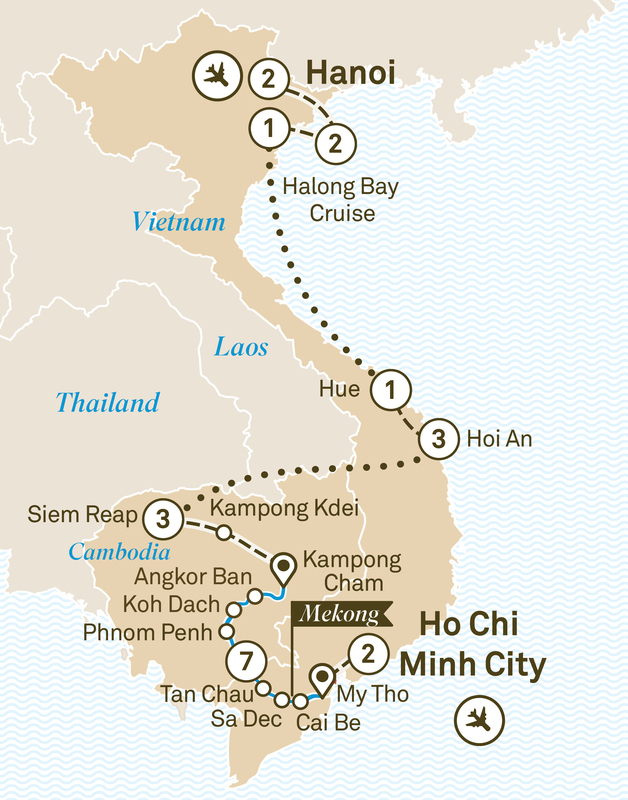 Then join Scenic Spirit on the Mekong to explore this fascinating landscape in ultimate luxury. Welcome to vibrant Vietnam. Enjoy the day at leisure and settle into a two night Special Stay at your iconic hotel in Hanoi. Begin the day with a Tai Chi lesson. Cruising into the National Park, try some kayaking, explore a limestone cave and discover Cat Ba Island. Return to Hanoi for another Special Stay and a historic bunker tour at the hotel. Tonight enjoy a Vespa foodie tour of Hanoi’s old quarter or La Terrace at Sofitel. Alternatively, sample the nearby Ly Club. Enjoy your morning at leisure in Hanoi before flying to Hue, the former imperial capital. Check in for the night at your hotel. This evening’s Royal Dinner is in a traditional private garden house accompanied by Hue Royal Court music. Visit the Mausoleum of Emperor Tu Duc and the grandeur of Hue’s Imperial Citadel. During an inspiring visit to Duc Son Pagoda, talk with the nuns and learn how they are supporting the orphanage. Later, travel along the breathtaking Hai Van Pass to Hoi An where you will enjoy a three night stay at your hotel, which includes a daily spa journey as part of your stay. Take a walking tour of Hoi An’s World Heritage-listed Old Quarter before stopping at the home of a former merchant to learn all about what life is like in Hoi An. Dine at the Glory Restaurant or embark on a culinary journey at Ancient Faifo. Alternatively, visit Brother’s Café. Visit the temple ruins of My Son. Alternatively, enjoy an interactive cooking class at Red Bridge Restaurant or cycle to a nearby farming village. Fly to Siem Reap, Cambodia for your three night Special Stay, located within walking distance to the markets.